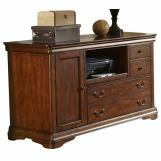 This Brookview Home Office Collection provides essential storage for your office technology. 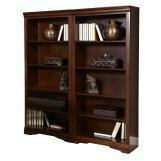 Locking casters give you the ability to move the piece when you want to rearrange your home office space. A bottom file drawer allows you to organize important papers and a pull out shelf gives you easy access to your printer. With a removable shelf that is hidden behind the side door, your computer tower is stored and out of the way. Wire management is provided with built in provisions that allow you to organize unruly cords and wires. 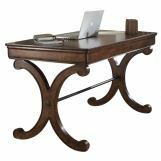 Bracket feet, traditional style apron and the antique brass hardware complete the look of this Brookview Home Office Collection.